Breast cancer is a challenging disease because as we learn that early detection can save lives…at the same time the numbers of cases will increase 50% over the next 15 years. Everyone has a friend, a neighbor or family member who had been affected by breast cancer and each story is different. Their stories evoke all types of emotions…gratitude, anger, deep sadness, joy, and frustration. Each of these stories teaches us something and makes us look at our own lives in a whole new way. Please join us in helping to make these stories as positive and noninvasive as we can for the Gunnison Valley community. Please help us to make our local hospital the best it can be for breast care and help us to keep our friends here while they navigate through detection and diagnosis. Help us to make sure that their journey is as positive as it can be and that they can carry on with their day to day lives here. 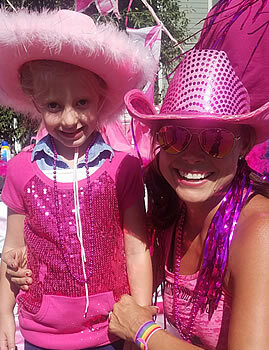 Cattlemen’s Days Tough Enough To Wear Pink strives to take excellent care of each person as if they are a close friend or family member. This is a true grass roots organization and is fueled by love and passion…we need you! Please support Tough Enough To Wear Pink by donating or volunteering today. Your receipt from PayPal will show payment to cbryant@gunnisonsl.com, Cattlemen’s Days TETWP Treasurer.